As cold winds filled the air in Jefferson City on January 23, more than 300 people crammed into the sanctuary at Quinn Chapel AME Church for the founding convention of “Faith Voices for Jefferson City.” This new community advocacy organization is a local chapter of Missouri Faith Voices. The crowd echoed the theme for the night, “Claim the Dream,” each time a speaker mentioned it. 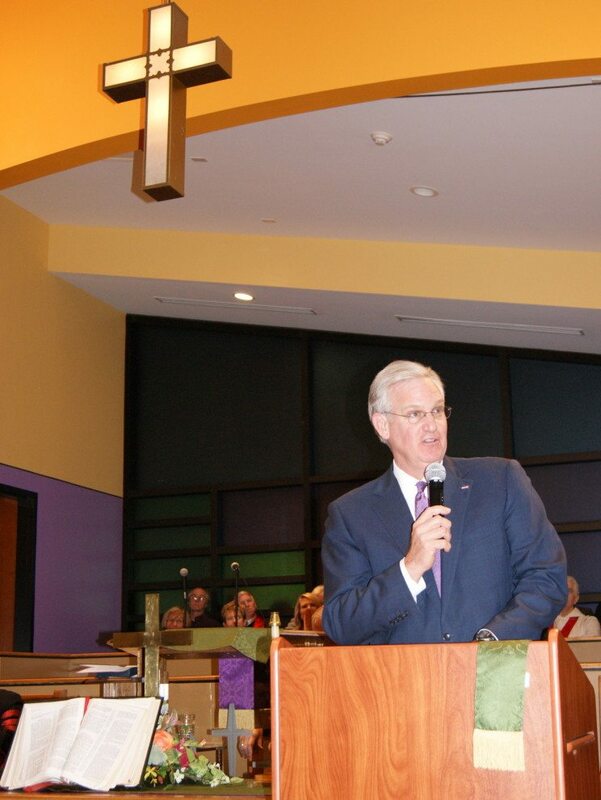 In addition to a packed panel of local clergy and citizens, the standing-room-only crowd also heard from Missouri Governor Jay Nixon and local State Representative Jay Barnes. Churchnet Executive Director Jim Hill serves as president of Missouri Faith Voices and spoke at the Faith Voices for Jefferson City gathering last week. One of the three aspects of Churchnet’s First Priority vision is community advocacy, which includes following the biblical witness of speaking and acting on behalf of the poor and marginalized in our communities. Former Churchnet President Doyle Sager, Senior Pastor of First Baptist Church in Jefferson City, also spoke at the event. Gaydos also explained his tradition’s focus on the importance of marriage and families, the dignity of work and the labor rights of workers, and the call to care for God’s creation since it is “not just an Earth Day slogan, it’s a requirement of our faith.” With his passionate discussion of historic Catholic social justice positions, Gaydos established the importance for all Christians to engage in community advocacy as an integral part of one’s faith. Jeanie McGowan, Churchnet’s Leadership Development Team Leader, attended the event and has been involved with past Missouri Faith Voices efforts. As she reflected on the night, she echoed the call of Gaydos to live our the biblical teachings by advocating for justice. In addition to Nixon and Representative Barnes, six of Jefferson City’s City Council Members attended the gathering. After singing and praying, the crowd dispersed into the cold air with warm spirits and a renewed commitment to claim the biblical dream that justice would roll on like a river and righteousness like a never-ending stream.